Before hibernation (brumation) occurs, behavioral changes take place in your tortoise over a period of weeks. By September and October it will eat less. Be sure to offer a drink and a soak in the water dish or basin. The tortoise will spend more and more time in the winter burrow until it no longer emerges. The best place for both hatchlings and larger tortoises to hibernate is in an underground burrow several body lengths long. Burrows should keep the tortoises from overheating in summer and freezing in winter. Only in an outdoor setting can the fall and spring adjustment periods proceed normally. In winter, most indoor temperatures are too warm and dry to slow the metabolism at a time when a tortoise normally does not eat and is programmed to sleep. A tortoise kept too warm in winter may be dehydrated, debilitated, or dead by spring. Temperatures from 35-50 degrees Fahrenheit are needed during the winter. With a few simple arrangements, desert tortoises can live safely in a climate cooler than their natural range. Wooden and cardboard tortoise brumation boxes in storage area kept at 40 to 50 degrees F. handy thermometer nearby. Tortoises need to brumate (hibernate) indoors from approximately September/October to about mid-April to May, especially when night temperatures fall below 40°F outside. In the spring and fall, when temperatures fall below 40ºF at night, a tortoise can be outdoors during the day but must be moved indoors at night to a special space you provide. In spring and fall, you will always need to keep a close eye on the weather. You will want a burrow that allows you to reach inside to remove the tortoise when needed. Where should my tortoise spend the winter? Tortoises spend the winter months brumating. Since the ground freezes, it is too cold for them to stay outdoors in northern Nevada. No outdoor burrow is adequate. Your tortoise needs a safe place indoors where the temperature will stay between 40°F and 50°F. You will want to check temperatures weekly with a thermometer. House the tortoise in a wooden or plastic opaque (not clear) storage bin that is sturdy and big enough for the tortoise to turn around, but not climb out of. Make sure there is a little air circulation or that the top is on loosely. A cardboard box can be used but is not as sturdy as wood or plastic. 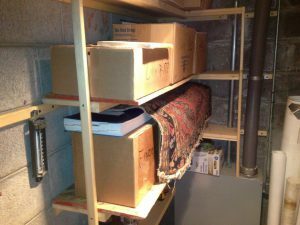 A snug box with a low ceiling simulates a good burrow and prevents loss of moisture. Cover the bottom with folded newspaper (not shredded). Never allow a sick tortoise to go into brumation. You will need to keep the tortoise awake and treat it during the winter. How and when do I transfer my tortoise inside in fall? 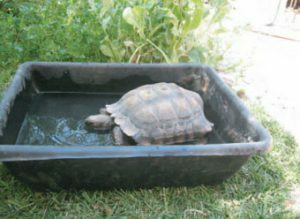 In the weeks leading up to brumation, soak your tortoise several times to provide good hydration for the winter. Allow your tortoise to go into brumation in its burrow. It will come out less and less often. It is probably brumating when it has not come out during the day for at least one week, depending on the weather. Reach into the burrow and pull the tortoise out. The tortoise should be nice and cool. Place the tortoise in its box, and put the box in your indoor storage area. Soak your tortoise 20-30 minutes in lukewarm water several times before and after brumation. How do I bring my tortoise out in spring? In mid- April to May, when outdoor temperatures reach 70°F or 75°F, move your tortoise to an area that is 55°F – 60°F. When your tortoise starts to stir, take it outside on nice (not windy) days when the daytime temperatures reach 70°F or 75°F. Keep a sharp eye on the weather for a cold snap. You can leave your tortoise in its burrow if the nighttime temperature does not drop below 40°F. Cover the burrow opening at night with a blanket to retain the heat. A thermometer in the burrow can be a big help. If the temperature gets cold (below 40ºF ), or windy, bring the tortoise in for the night. On a nice warm day, give your tortoise a spring soak!